The second book of the series has JUST been released and is available for purchase! New Smyrna Beach occupies a notable place in history as the one of the oldest cities in Florida, site of the largest single attempt at British colonization in the new world. 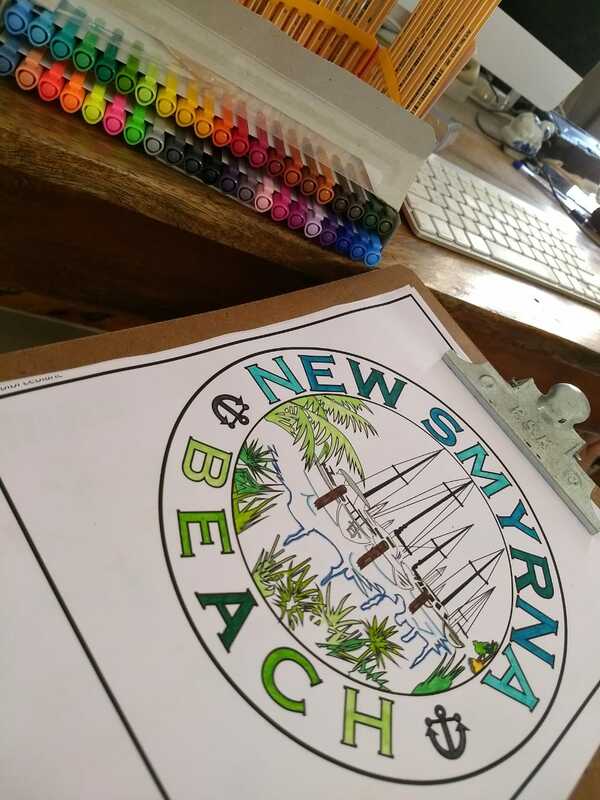 The Pre-Columbian history of New Smyrna begins thousands of years ago with the Native Peoples who lived and thrived here as hunters, gatherers, and fishermen. The Timucuan Indians, who had a highly developed, complex social system, were a strong and aristocratic tribe in this area for hundreds of years until Ponce de Leon, the Spanish explorer, arrived. Evidence of their lives here still exists in numerous Indian middens (shell mounds) and burial sites. Sadly, within 200 years of Ponce de Leon’s landing here in 1513, the strong Timucuan population had vanished. First settled by Europeans in 1768, Dr. Andrew Turnbull, a Scottish physician, brought 1,400 indentured servants from Greece and Italy to East Florida. He established the colony of New Smyrna, named after the home town of his father-in-law. The majority of the colonists came from Menorca, one of the Mediterranean Balearic Islands of Spain. Although the colony produced relatively large amounts of processed indigo in its first few years of operation, it eventually collapsed after suffering major losses due to insect-borne diseases and Indian raids, and growing tensions caused by mistreatment of the colonists under Turnbull's overseers. About 600 survivors relocated to St. Augustine, where they settled by 1777. Some measure of settlement persisted after the departure of the disaffected colonists, despite the menacing presence of hostile Indians and occasional mercenaries of various stripe. The Spanish reclaimed East Florida from the British in 1784 but encountered difficulty in securing control over the vast and essentially unpopulated land. The United States acquired the colony from Spain in 1819 and established the Territory of Florida in 1821.
concentrated primarily on the production of sugar. All gains made toward settlement here, however, were lost during the first year of the Second Seminole War (1835-1842), when many of the plantations were attacked and destroyed by Indian raiding parties. A measure of order was reestablished when the United States Army set up a military base at New Smyrna in 1837, but few settlers returned to the area. Resettlement began in earnest after the Civil War. In 1887, with a population of 150, the Town of New Smyrna was incorporated. The arrival of Henry Flagler's Florida East Coast Railway in 1892 spurred development of the area's economy, which was based on the tourism, citrus, and commercial fishing industries. Today, New Smyrna Beach is a charming beach town rooted in local culture, art and a beautiful white, sandy shoreline. It is also known for its coastal architecture and personality. It is a prime location for surfers as well as visitors looking for a laidback community filled with hidden adventures. Come experience this delightful beach town with it’s intriguing history, artistic talents, one-of-a-kind boutiques, local eateries and more outdoor activities than your calendar can hold. Add the drivable beach, eco-tourism and pet-friendly amenities to the mix and you’ll have the perfect blend of opportunities waiting to be explored! Source: City of New Smyrna Beach with permission.